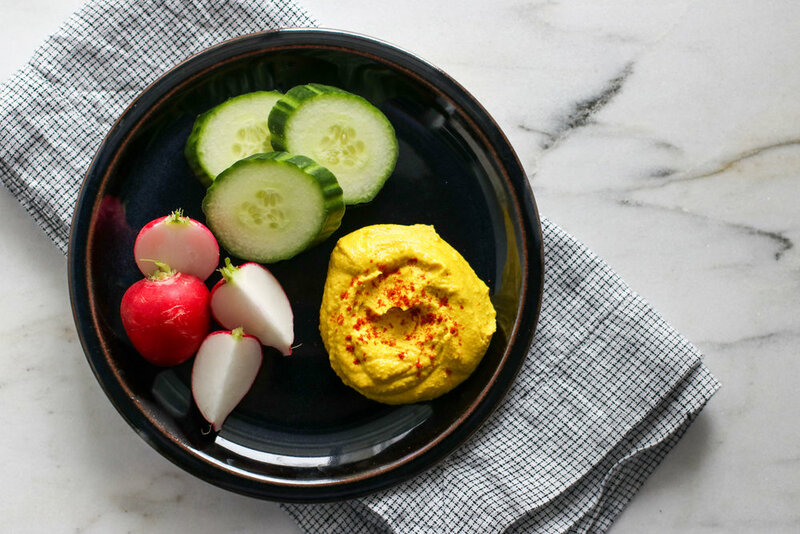 Turmeric Hummus — Erin Parekh | Live Well, Simply. This hummus is downright gorgeous. I mean look at the color! Not to mention it's loaded with anti-inflammatory goodness from the turmeric + protein, fiber, and healthy fats. Have you made homemade hummus before? If you have a blender or food processor, it's literally the easiest thing. And, it's so much tastier, not to mention cheaper than pre-packaged brands. As with anything homemade vs. store bought, you control the ingredients. Not a fan of garlic, remove it. Want a little more kick? Add some extra cayenne. That's how this turmeric version came into existence. I wanted to amp up the health benefits of my traditional hummus recipe for a workshop I was hosting. Now, this is almost the only hummus I make! Place ingredients in blender or food processor and blend until smooth and uniform, scraping down the sides as needed. Taste and adjust seasoning to your liking - more salt, pepper, lemon, etc. Transfer to a serving bowl and drizzle with additional olive oil. Serve with chopped vegetables. Hummus will keep well in the fridge for up to one week. Note: For traditional hummus, omit the turmeric and only add a pinch of cumin.